This title teaches new and experienced craftsmen how to do what they love without breaking the bank. It includes advice on making tools from scratch and buying secondhand and brand new equipment. In today's economy, it's hard to keep up with expensive hobbies, like woodturning. Buying new tools, lathes and fancy wood can be costly. But, with the secrets inside "The Frugal Woodturner", new and experienced craftsman will learn how to do what they love without breaking the bank. This new do-it-yourself book from master turner and tool expert, Ernie Conover, shows readers how to get started on three different budgets: the Tight and Basic Budget in which readers learn how to make their own tools, the All-Around Budget in which readers discover how to buy quality used equipment and the Upscale Budget for readers who want to buy new equipment. And for those experienced turners, Conover's advice on making your own gouges, scrapers and chisels is invaluable. He also provides instructions for making your own faceplates, chucks and more. 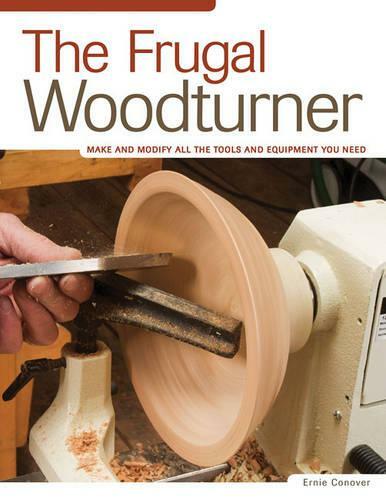 After reading "The Frugal Woodturner", turners will be able to recognise what's a bargain and when to close their wallets. "The timing of The Frugal Woodturner could not be more appropriate...Today, much of our focus in making has shifted to our finished products rather than the value of the time and the methods we use to make them. Conover's thesis is to reclaim the value of being problem solvers as we relearn to make the things that allow us to make the things that fill our lives with joy. The tools, the jigs and the methods of making - it's all here". - David Ellsworth, Author of "Ellsworth on Wooturning"
"The marvelous, and large, color photos seem to bring the reader right up to Conover's work bench. - Book News, Reference & Research"
"For experienced turners, Ernie's advice on making your own gouges, scrapers, and chisels is invaluable. - Chip Chats Magazine"